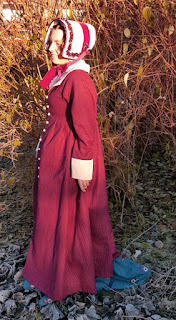 I took a break from planning this spring's teaching and asked Rickard to take photos of me in my new wool redingote and velvet bonnet outdoors. The sun was shining brightly so the colours are...interesting. More pictures and some construction info this way. It is interesting how the color of the ribbon on the bonnet looks bright red in this photo, and not burgundy. It's a lovely ensemble, though!